And I guess that’s because of the current (mostly negative) hype surrounding high-frequency trading. A truthful answer to their question is “sometimes but not always”. In order to explain, let me quickly review the process of trading (for the sake of brevity I will stick to the buy-side’s point of view). The diagram above shows the processing of an order from investment decision down to the execution of a trade. In this example, the process begins with an analyst’s idea that leads to a decision to trade. The idea is assessed and approved by the portfolio manager who generates an instruction to buy or sell a certain quantity of asset ‘abc’. The order is then passed on to a trader whose job it is to decide the best approach/broker to use. Direct-Market access (DMA) represents the client’s ability to access brokers order routing infrastructure, allowing them to issue their orders almost directly to the exchanges. Sponsored access is a step up from DMA, these tend to be ultra low latency, direct connections to the market. 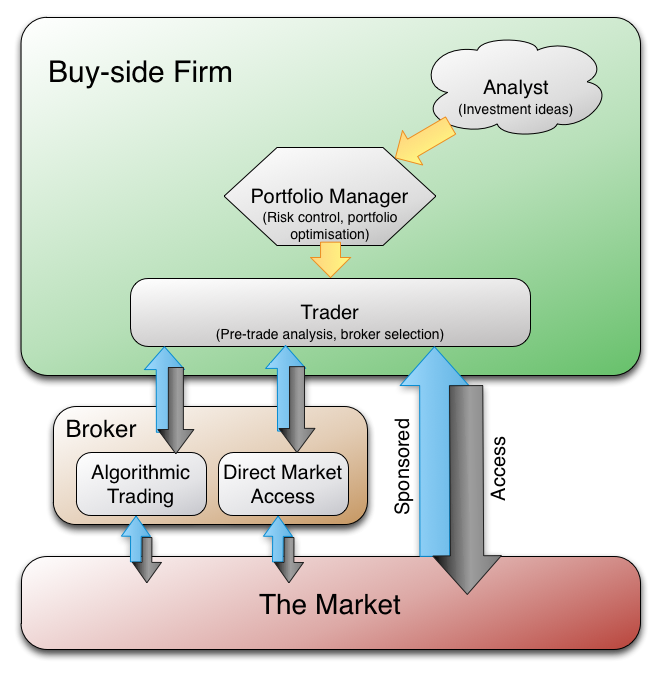 In this situation, the client uses their own infrastructure but with the broker’s trading identifier. 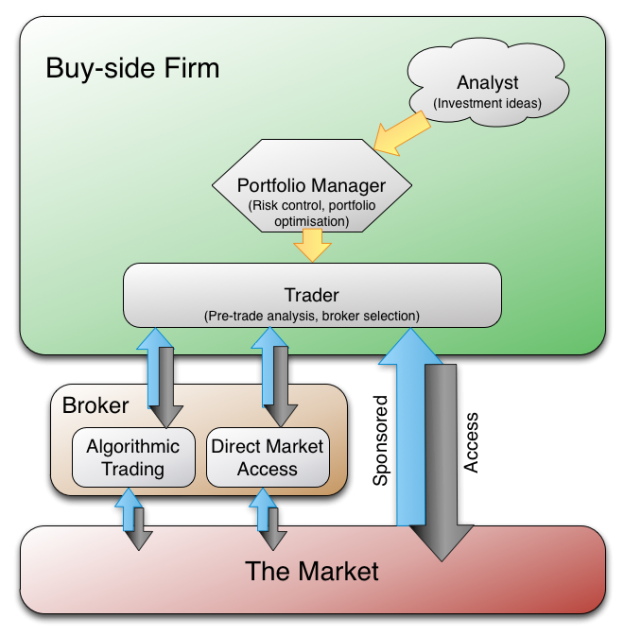 Sponsored access is (predominantly) used by clients exploiting high-frequency trading strategies. Algorithmic trading refers to trade execution strategies that are typically used by fund managers to buy or sell large amounts of assets. They aim to minimise the cost of these transactions under certain risk and timing constraints. Such systems follow preset rules in determining how to execute each order. People often think of these systems as buying low and selling high – making investment decisions – but this is not the case. Algorithmic trading systems are offered by many brokers and simply execute the orders that they are given. Their job is to get a good price (as compared to various benchmarks) and minimise the impact of trading. This is done by slicing orders and dynamically reacting to market events. Of course there are algorithms that deal with investment decision making and this is where automated trading comes in. Automated trading, often confused with algorithmic trading, is the complete automation of the quantitative trading process. Thus, automated trading must encapsulate: quantitative modelling and indicator tracking to determine trade initiation and closeout; monitoring of portfolio risk; as well as algorithmic trading. This type of trading tends to be done by quantitative hedge funds that use propriety execution algorithms and trade via DMA or sponsored access. High-frequency trading (HFT) is a subset of automated trading. Here, opportunities are sought and taken advantage of on very small timescales from milliseconds up to hours. Some high-frequency strategies adopt a market maker type role, attempting to keep a relatively neutral position and proving liquidity (most of the time) while taking advantage of any price discrepancies. Other strategies invoke methods from time series analysis, machine learning and artificial intelligence to predict movements and isolate trends among the masses of data. Specifics of the strategy aside, for HFT, monitoring the overall inventory risk and incorporating this information into pricing/trading decisions is always vital. Just remember, algorithmic trading should have been called “algorithmic execution”; automated trading does what it says on the tin; and HFT is a specific type of ultra-fast automated trading. This entry was posted in Algorithmic Trading and tagged algorithmic trading, automated trading, HFT on November 16, 2012 by Ash. In your experience then, how would you rank these three trading formats in terms of their trade latency? Can you elaborate on the difference between “Automated Trading” and HFT? In your definition, it looks to be the only difference being the size (notional or actual?) of the trades?